Download the entire Reinhardt University Student Handbook (pdf) here. 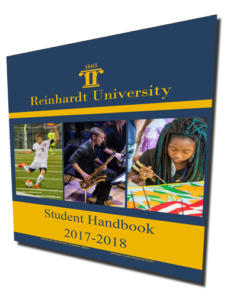 The Student Handbook of Reinhardt University provides current information regarding the many resources and services that support learning inside and outside the classroom, and the standards of conduct for the campus community. Students are expected to familiarize themselves thoroughly with program and degree requirements. The Student Handbook is for informational purposes only and should not be construed as the basis of a contract between a student and the University. While provisions of the Student Handbook will ordinarily be applied as stated, Reinhardt University reserves the right to change any provision listed herein without notice to individual students. Every effort will be made to keep students advised of any such changes.